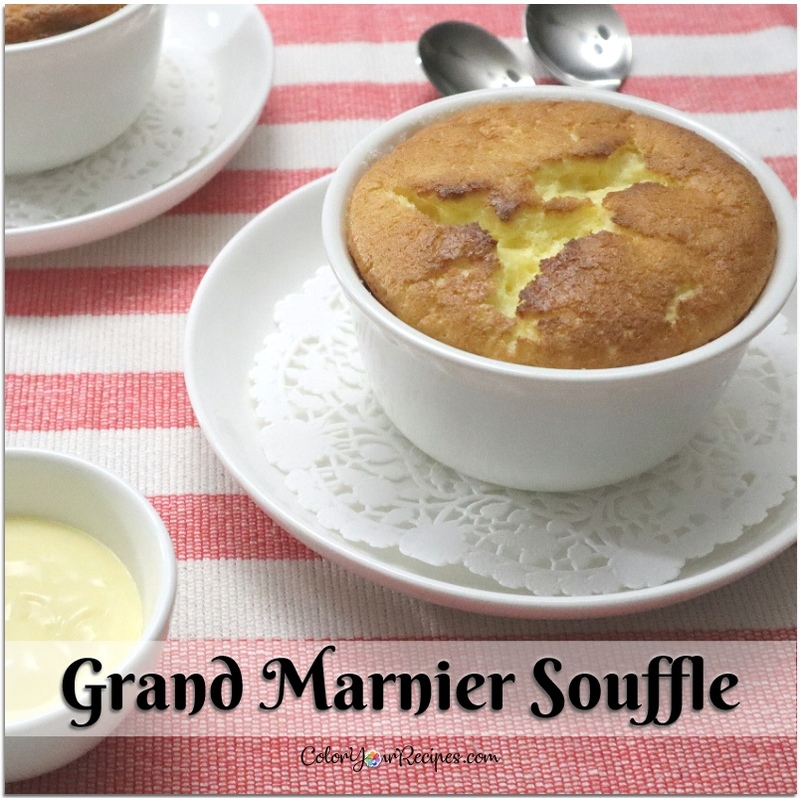 The combination of the creamy crème anglaise with the light and aromatic orange flavor soufflé is just divine, and it is much easier to make than you imagine…elegant dessert for any special occasion. 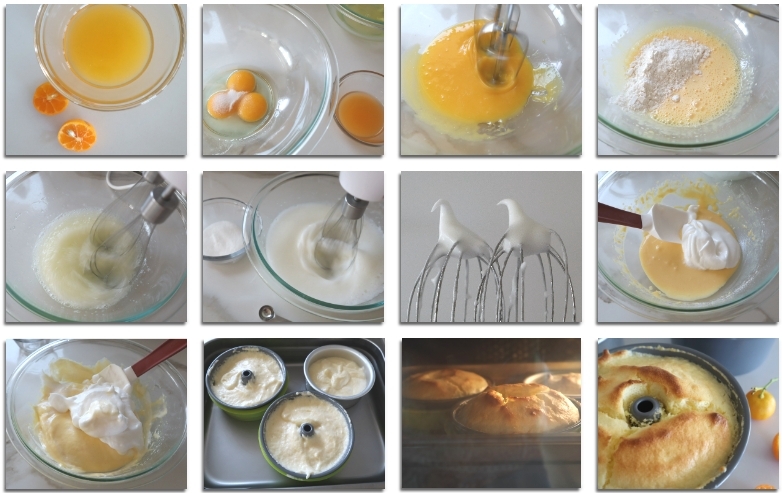 Soufflé is a French dish based with eggs and mainly two elements. 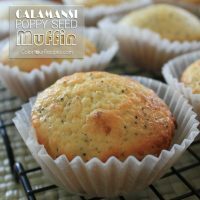 – Can I make savory soufflé? Absolutely, and the most well know are cheese soufflé, but they can be of vegetables, meat, poultry and so on. 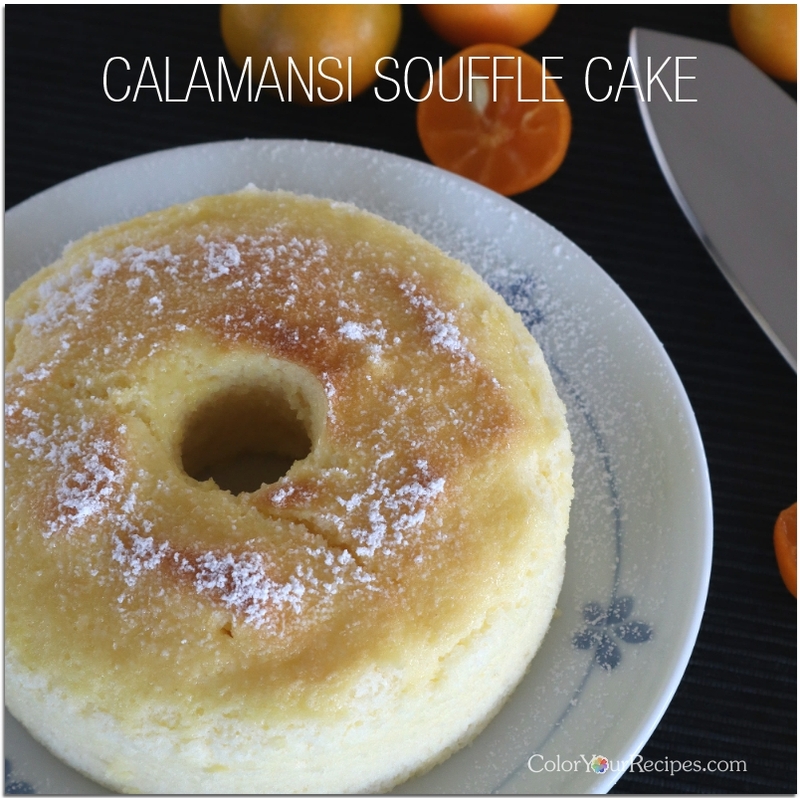 – Can I make soufflé in advance? 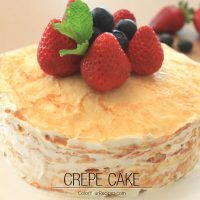 Partially, the sauce component of the souffle can be made in advance and stored in the refrigerator, but the egg white will need to be beaten and folded to the cream just before baking. 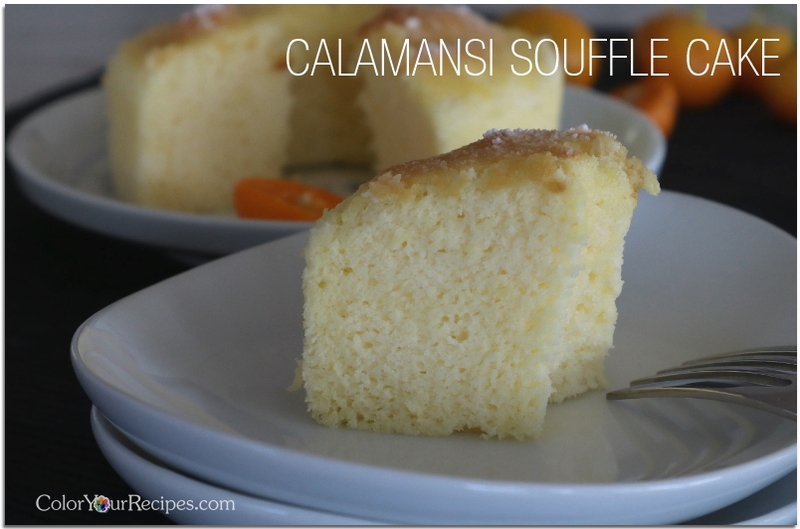 – How do I serve soufflé? Generally, souffle are served hot with sauce such as crème anglaise, fruit sauces, chocolate sauces or ice cream on the side. 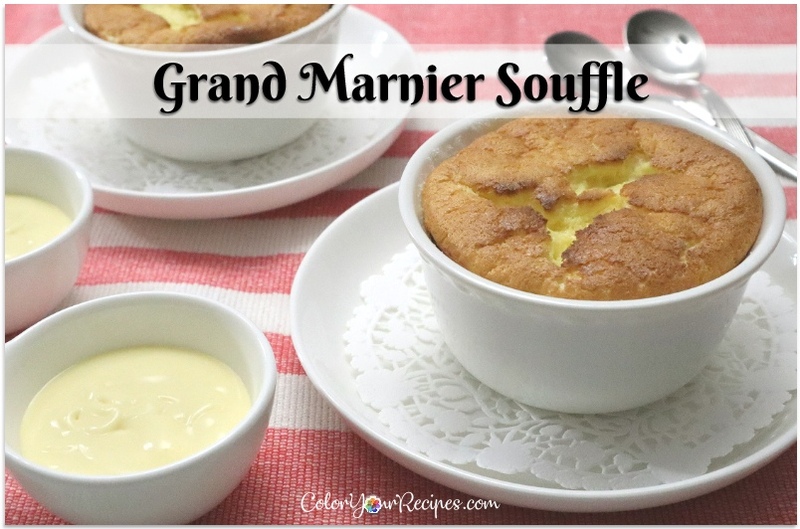 – Why my soufflé collapsed? Unfortunately, even the most perfect and beautiful soufflé will collapse eventually. Soufflés are not like cakes, they will deflate…therefore when making soufflé you have to move fast and serve the soufflés immediately when out of the oven…and be able to see it collapse on the table. 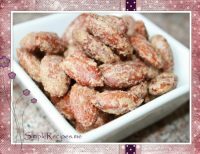 – Ready to explore the recipe? 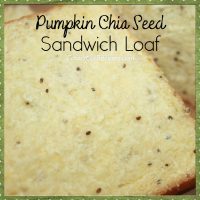 As stated above, this recipe was based on the Food Wishes recipe with minor adjustments. I served the souffle with crème anglaise. 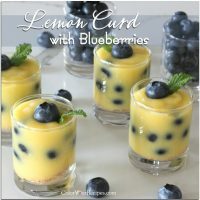 Brush the insides of 2 (approximately 8-ounce) ramekins with ½ tablespoon melted butter and sprinkle with approximately 1 tablespoon sugar. 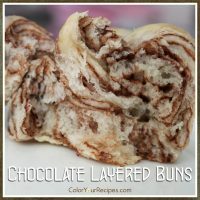 Place on a baking sheet lined with aluminum foil, in case of overspill. Melt the butter in a saucepan over medium-low heat. Stir flour in the melted butter until golden brown and aromatic, about 2 minutes. 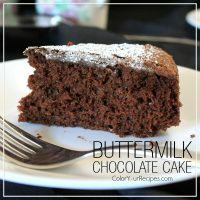 Pour in milk into the butter/flour mixture, stir continuously, until smooth and thick, approximately 3 to 4 minutes. 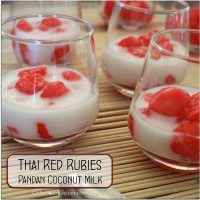 Remove from the pan and transfer to a mixing bowl, allow to cool. Add orange zest and Grand Marnier into cooled butter mixture and combined well. 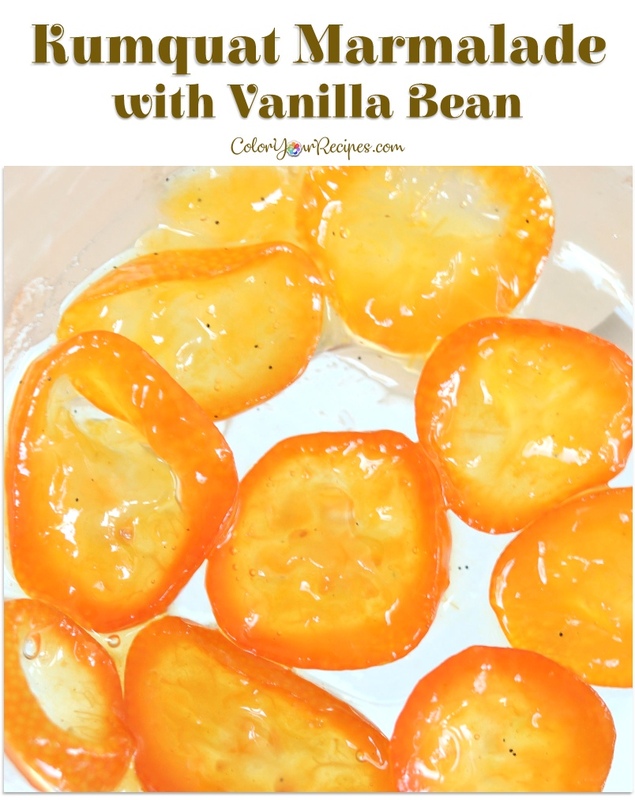 Add egg yolks and vanilla, mix until smooth. In a large bowl, whisk egg whites until frothy. Slowly add half of sugar and continue whisking until combined. Add the remaining sugar and continue to whisk until soft peaks form. 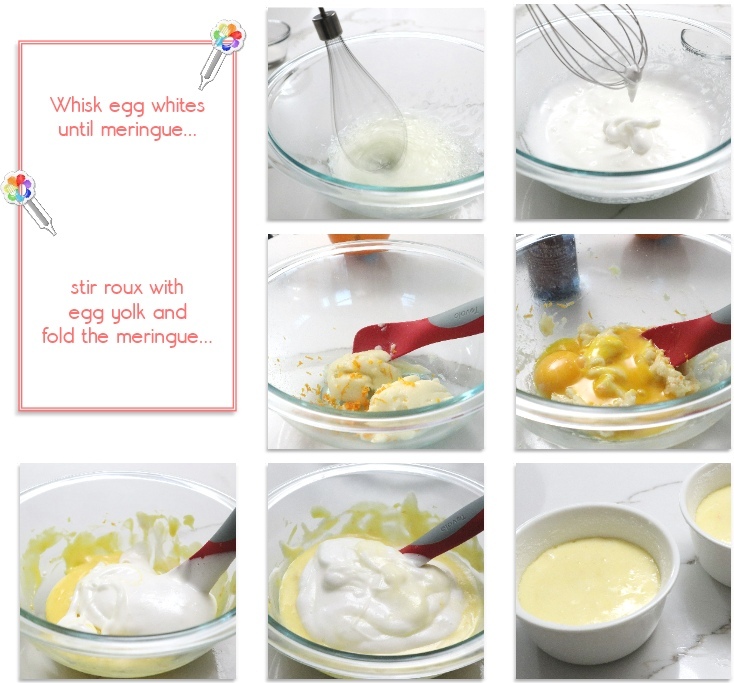 Fold approximately ⅓ of the meringue into egg yolk/butter/flour mixture then fold in the remaining meringue, mix very gently until well combined. 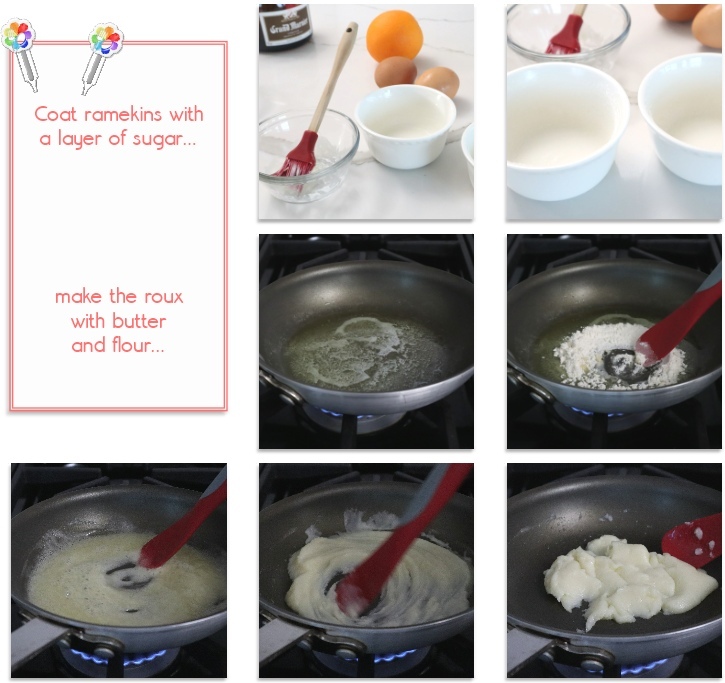 Pour the egg batter into the prepared ramekins, make sure to leave approximately ¼ inch from the top of the ramekin. 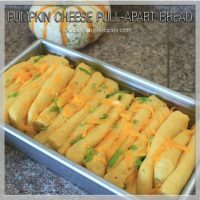 Bake in the preheated oven until browned, approximately 15-16 minutes. 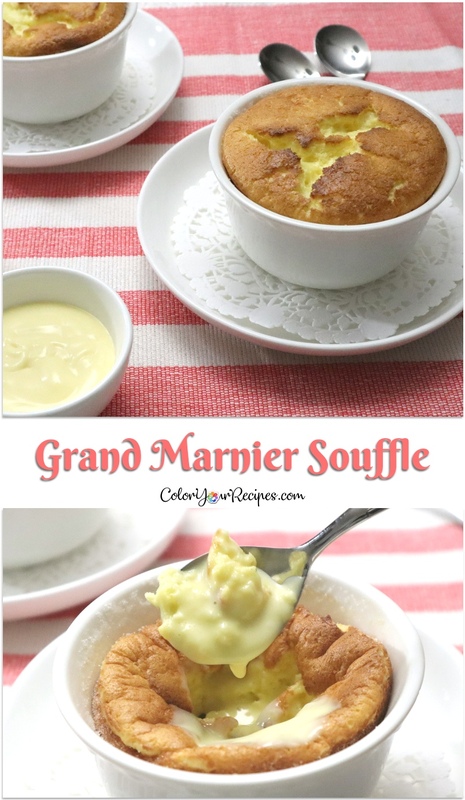 Did you know that souffle came from a French verb souffler? According to Wikipedia souffler in French means “to blow”, “to breathe”, “to inflate” or “to puff”. 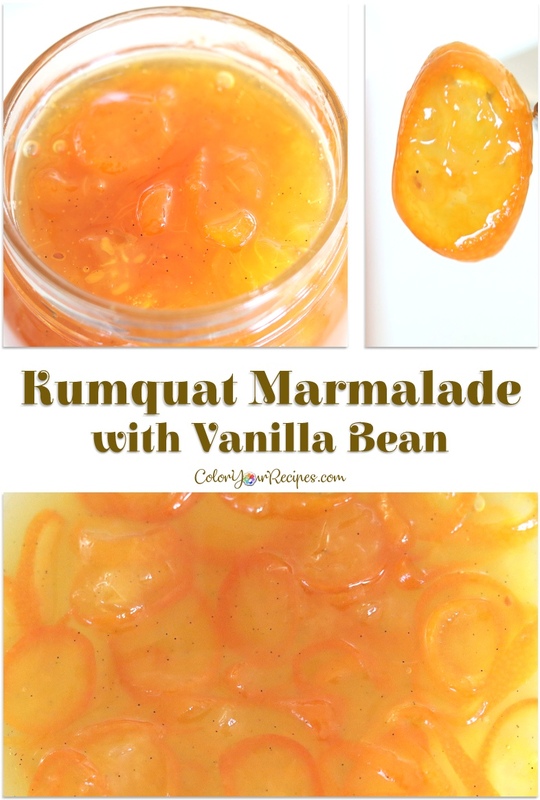 This creamy, rich and elegant vanilla custard sauce is very versatile, absolutely delicious added on cake, pie, fresh fruit…in another words, can be added to anything you like. 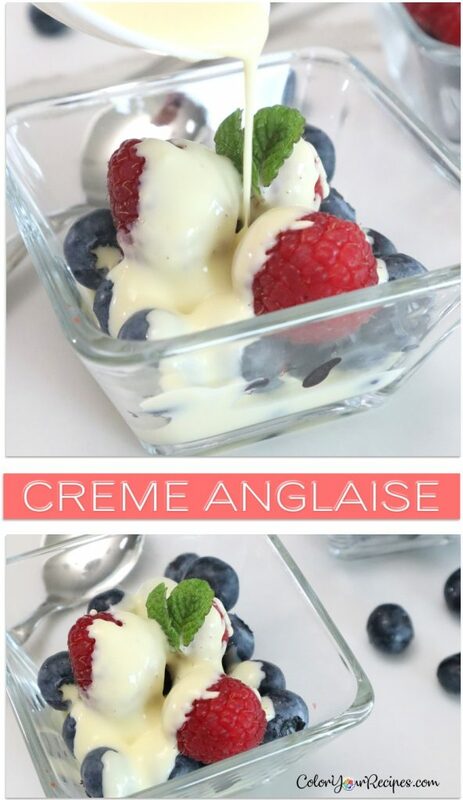 Have you noticed that most of the pleasures in life are usually the simplest…as is the case of this crème anglaise. 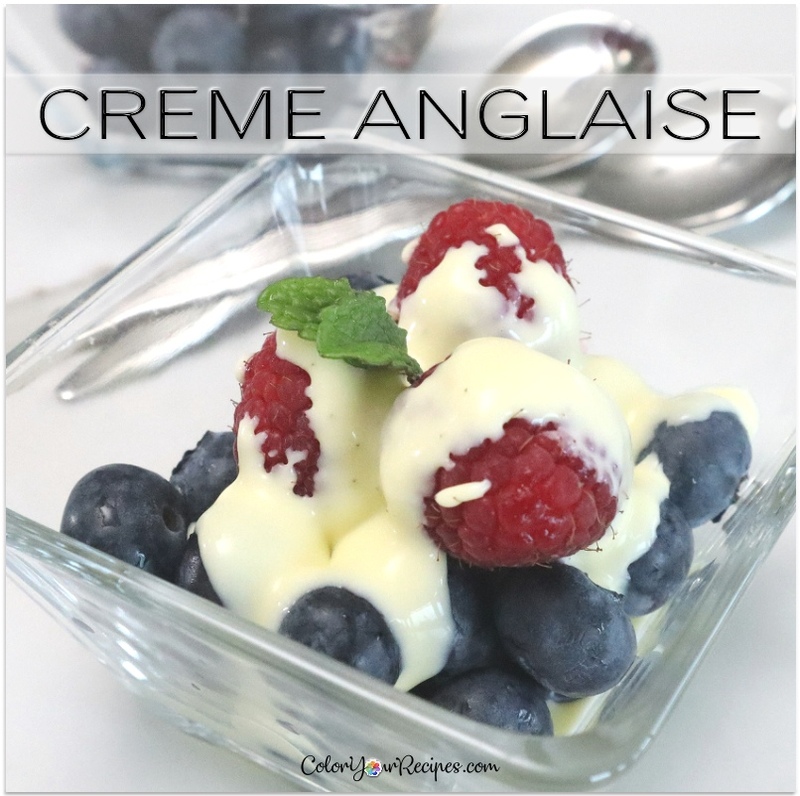 – Have you ever had crème anglaise? – Is there any trick for such an elegant sauce? No, it is mainly a thin custard with only a few ingredients. And the trick, if you want to call a trick is to avoid the sauce to curdle…by tempering the egg yolks. 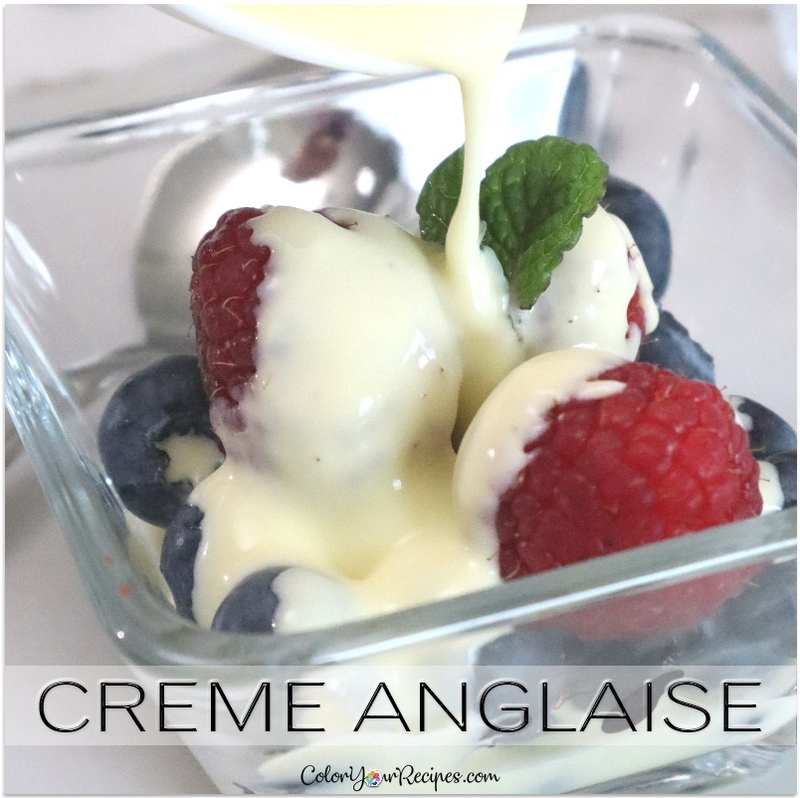 – How should I serve this crème anglaise? 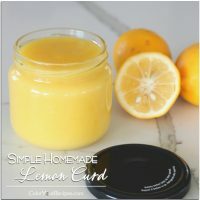 This sauce is so versatile…you can pour it over all kind of dessert, cakes, pies, tarts, souffles, fresh fruits (specially berries), the options are endless. 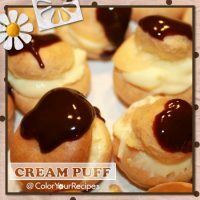 – Can I add other ingredients besides vanilla? 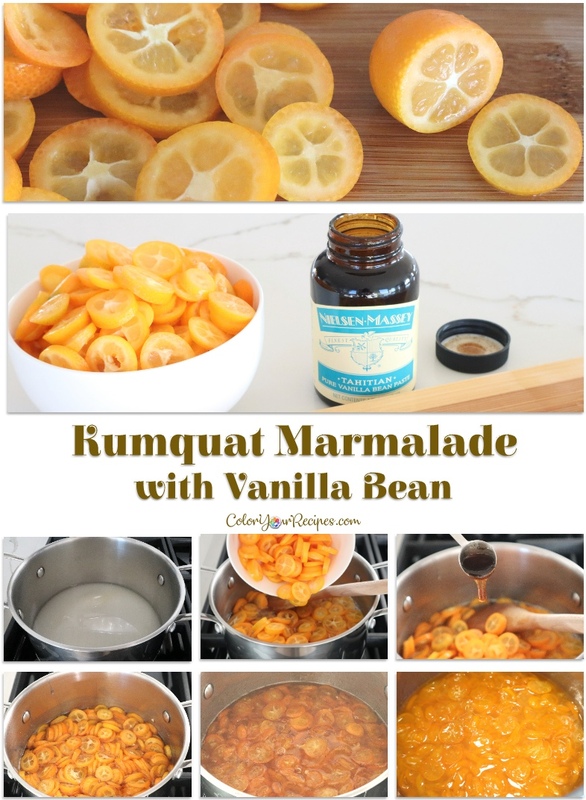 Absolutely, you can add rum, bourbon, brandy and liqueur, such as Grand Marnier, Amaretto, Cointreau or orange zest, lemon zest, mint, coffee…again, endless choices. 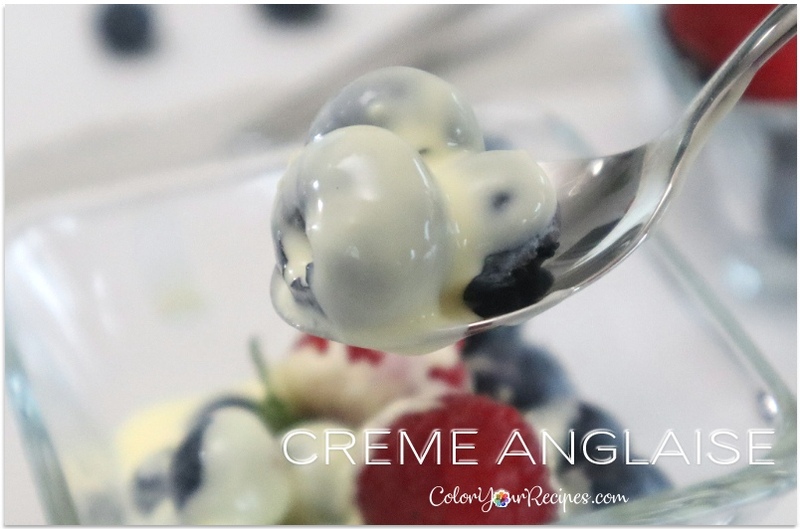 – Did I convinced you to give this crème anglaise a try? 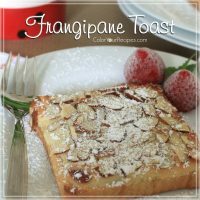 This recipe was mainly adapted from Food Wishes…if you like a lighter version you can substitute the heavy cream with milk or mix milk with heavy cream whichever ratio you like. In a medium bowl whisk egg yolks, sugar and Grand Marnier until smooth paste. In a small pan heat the heavy cream until almost boiling point, until small bubbles begin to appear around the edges of the pan. Carefully temper the yolks by pouring slowly the hot heavy cream to the egg yolk mixture, stirring constantly. Transfer the custard back to the pan and under low heat stir constantly until the custard thicken. If necessary, pour the custard through a fine mesh strainer to remove any clumps. Place the custard into a bowl and let it cool. Keep in the refrigerator until ready to serve. Good for up to one week in the refrigerator. 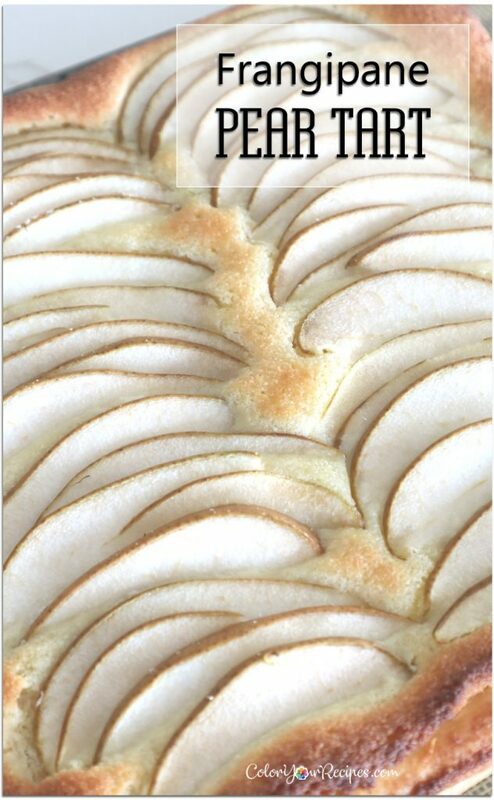 This is a classic made it simple…layers of sliced pear over a rich almond cream on a flaky puff pastry, perfect for the holiday. 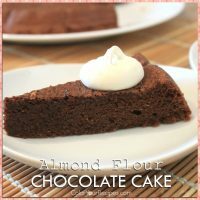 I always like baked goods with almond, and it can be in any form and shape…here I used almond meal. – Why is this so delicious? 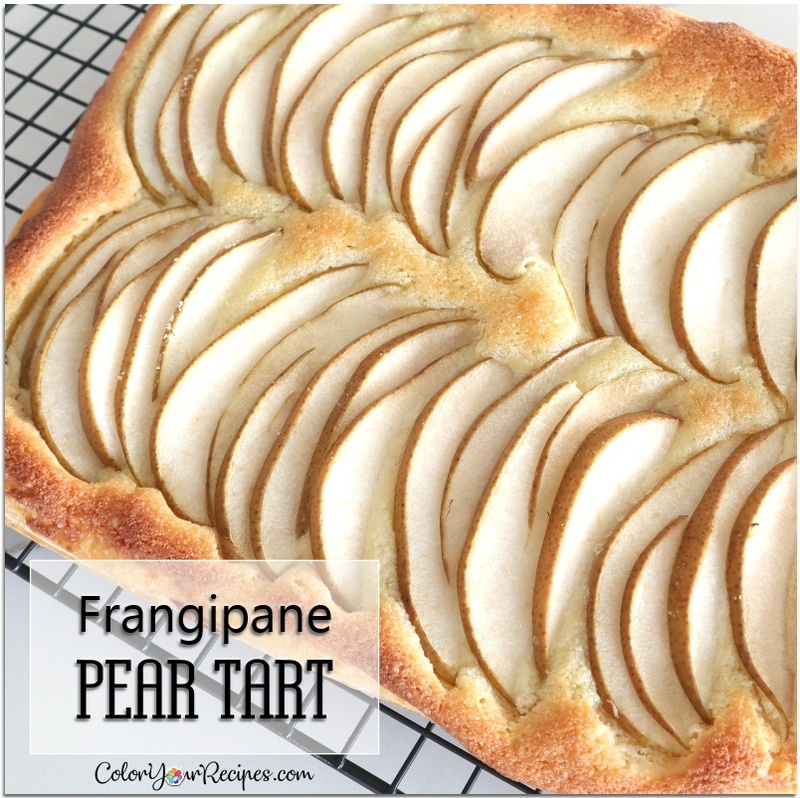 Somehow the combination of the frangipane, smooth, buttery, aromatic and rich almond cream with the simple slices of pear are a perfect match without being overwhelming. It is amazing how the simplest touch can boost your senses. – Why should you make this? 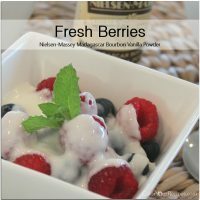 Before I continue with the recipe, I need to inform you that I accepted the offer to try Nielsen-Massey Holiday Flavors Bundle which come with 3 bottles of extract (Madagascar Bourbon Pure Vanilla Extract, Pure Almond Extract and Pure Peppermint Extract) and it is only available at Amazon . 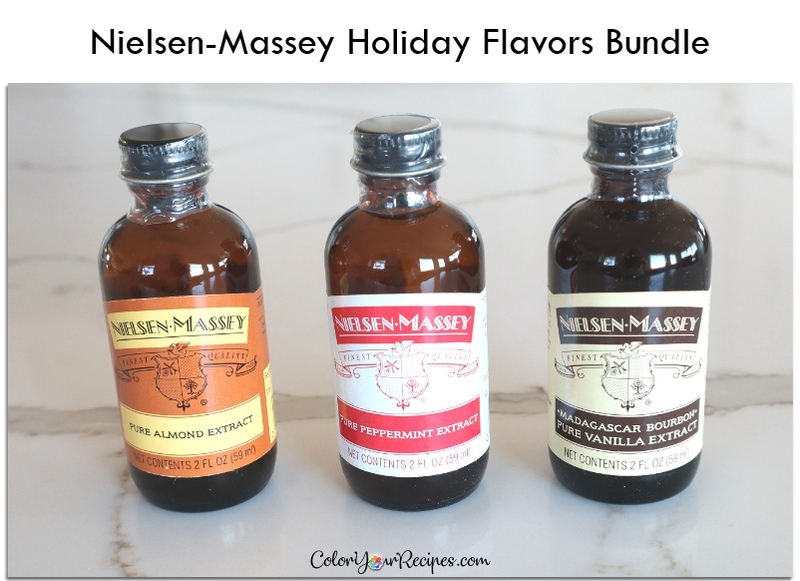 I received the Holiday Flavors bundle for review purpose and I was not financially compensated for this post, all the opinions are completely mine on based on my experience, and, I must confess… I love Nielsen-Massey products, I had the chance to try many of them and since then, when it comes to extracts they are my favorite. – Should we move to the recipe? In a medium bowl, mix the butter with the sugar until a smooth cream. Add to the cream the egg. Mix until blended in. 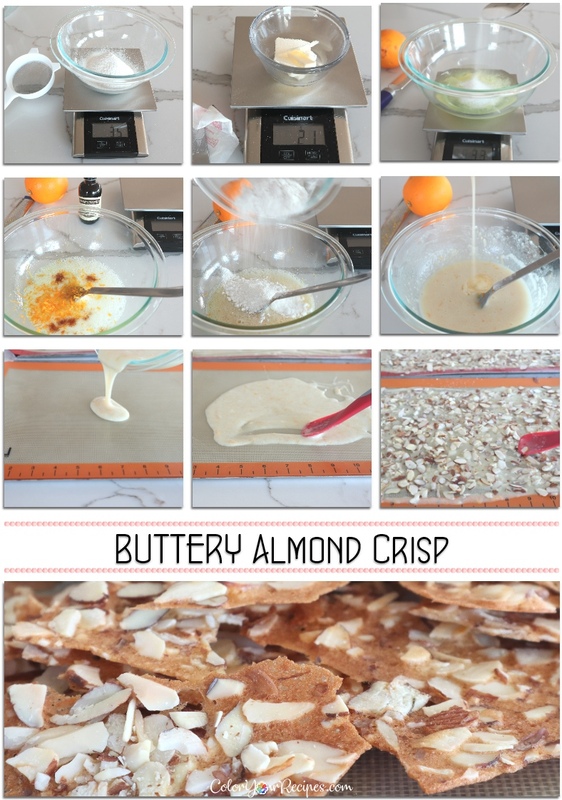 Add the almond meal and the almond extract. 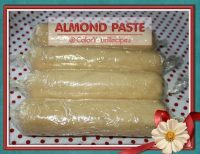 Mix until forms a paste and all the ingredients have been incorporated well. Set aside. Slice the pear into thin slices. 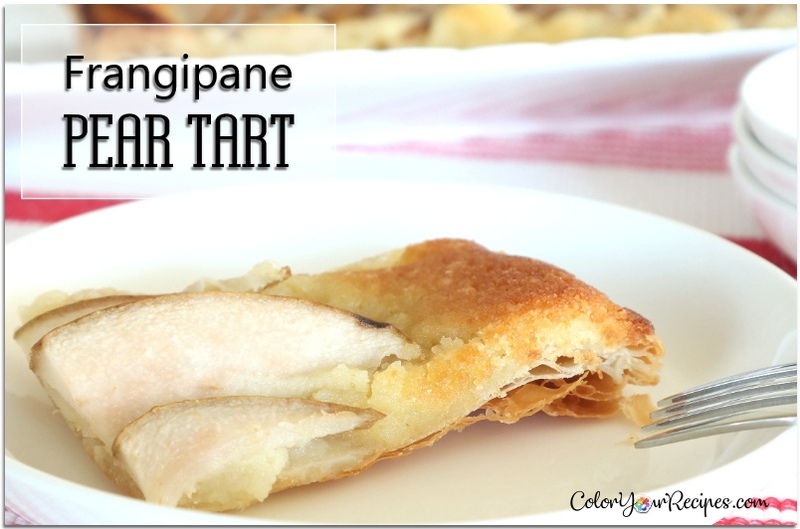 Mold the puff pastry by pinching the corner to form a tart. 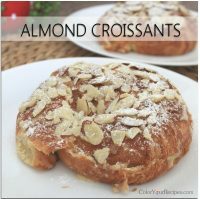 Spread the almond cream on the puff pastry and layer the sliced pear, by gently pressing on the almond filling. Bake at 400oF for the first 15 minutes and then lower the temperature to 350oF and bake for another 10 minutes until the puff pastry is golden brown. Remove from the oven and let it set on the counter. The center might be a little soft/wobbly, which is okay. It will set as it cools. Let the tart cool completely before serving. 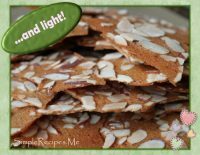 – Looking for more recipes with almond? 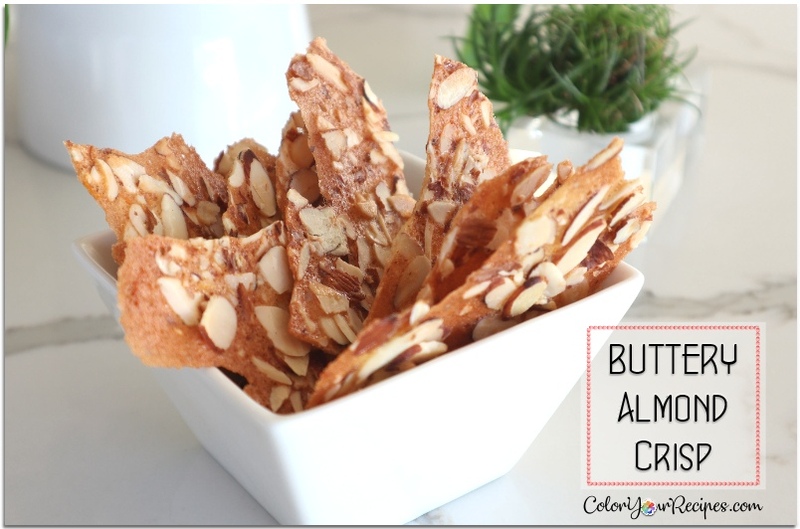 Did you know that almond is known for its health benefits? 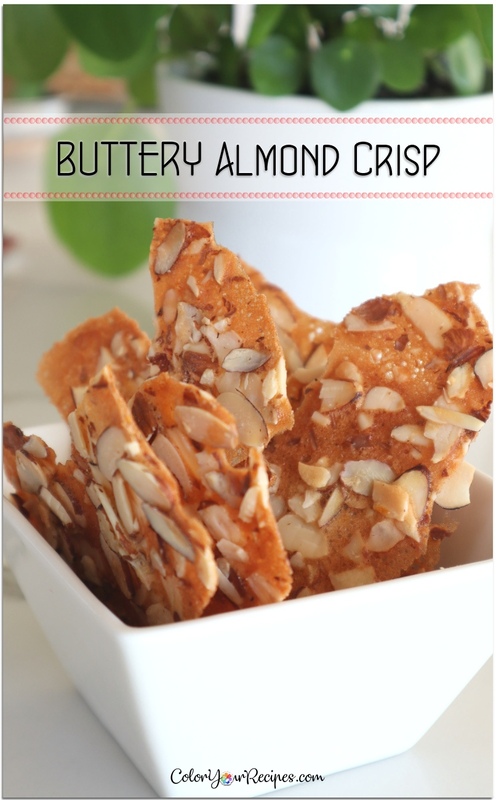 Almond contains high levels of vitamin E which is an antioxidant which can reduce risk of heart disease, cancer and Alzheimer’s disease. 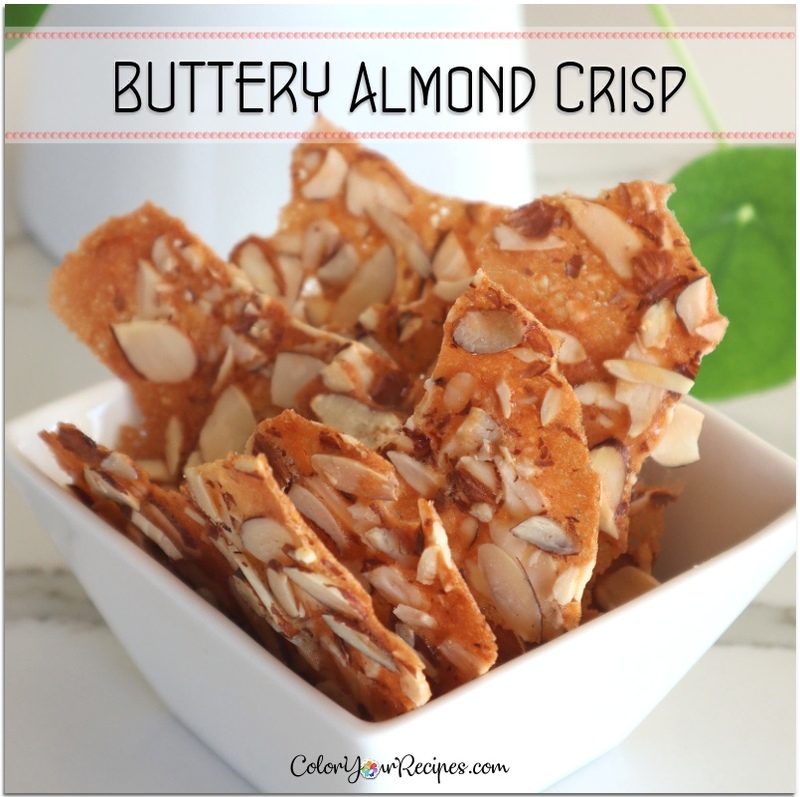 In spite of it claims one should note that almonds contain fat and it is high in caloric content, therefore consumed in moderation. 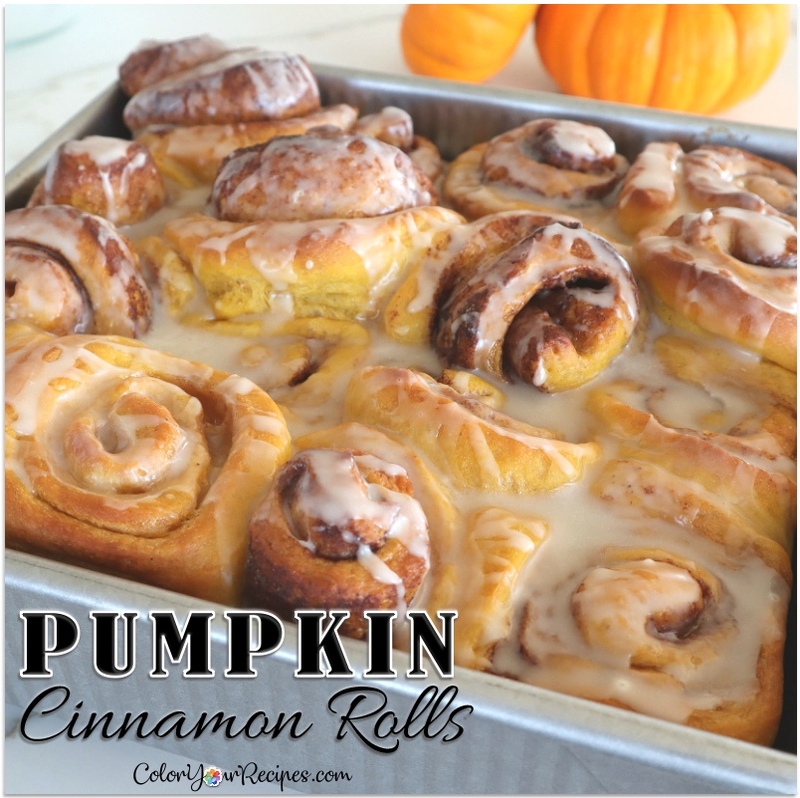 This soft and light cinnamon rolls are made with pumpkin and filled with gooey cinnamon swirl and topped with a light icing are the best treat for the season. – Why you need to try this? And of course I had to use “tangzhong” or “water roux” method, an Asian method used to keep the bread soft, light, moist for many many days. Whisk together the water and the flour until the mixture is well blended and free of lumps. Stir the mixture while it cooks over the medium heat to reach 65C/150F. It takes about 2-3 minutes. Continue whisking until the mixture starts to thicken. The mixture of flour will have “lines”. Transfer to a bowl, cover with a plastic film to avoid “skin” from forming. Ready to add to the bread dough once is cool. Water roux or Tangzhong can bend kept in the fridge for up to 48hours. In the mixer, add all the water roux, and all the other ingredients under bread, except for the butter. Turn the machine and stir for 2 to 3 minutes, until a ball forms. Increase the speed to “2” and let it mix for 5 minutes. The dough should be very sticky, and less sticky as the gluten forms. Add the butter and mix for 20 minutes more. Take a small portion of the dough (like a golf ball) and stretch gently until a very thin and transparent membrane (windowpane). If the dough tears mix for another 5 minutes until you achieve the windowpane test. The windowpane test, demonstrated that the gluten is very well developed and it will create a very light crumb. The dough should be very elastic. 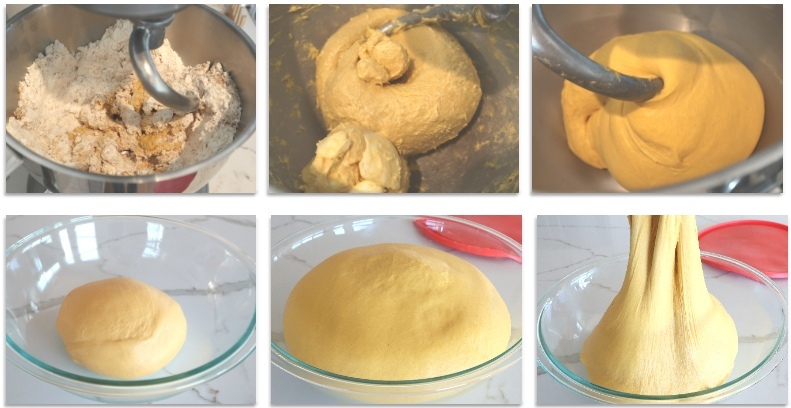 Remove the dough from the mixer and place in a bowl by covering with a plastic film. Let dough proof until the dough tripled to its original size. Knock back the dough and divide into 2 balls. 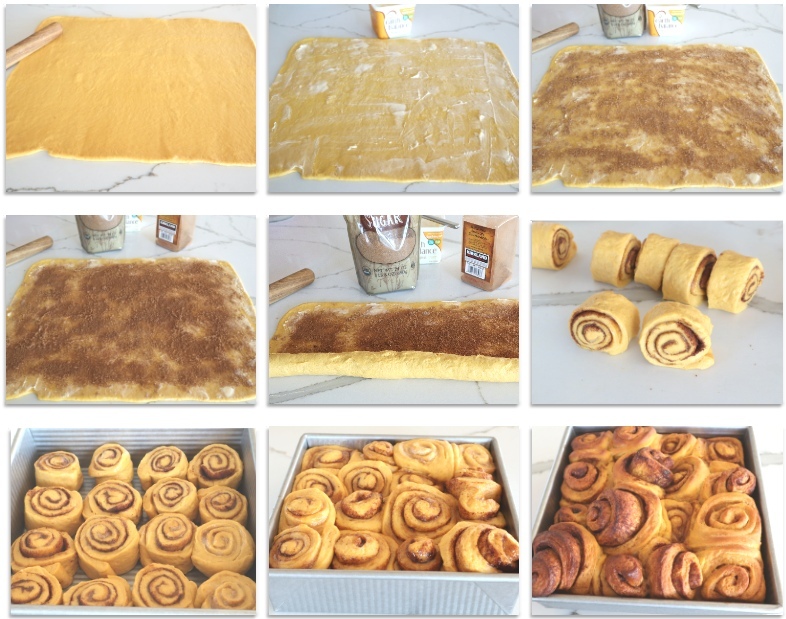 Roll one dough into a rectangle of approximately 45 x 35cm (approximately 18 x 14in). 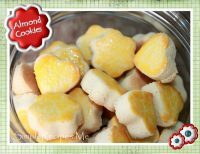 Smear a thin layer of butter or its substitute on the rectangle dough. Evenly sprinkle brown sugar and then cinnamon over the sugar. 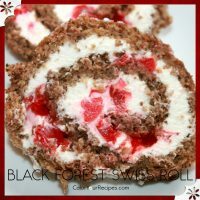 Roll it like a Swiss roll from the long edge, and roll it into a tight log. Turn the seam to the bottom. Make a small mark on the log in the middle and then into 4 and again and again until you have the log divided into 16. Gently cut on the mark without smashing the rolls. 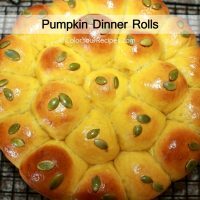 Place the rolls in a square or round pan, I used the 8 x 8 in USA square pan. Cover and let it rise until doubled in size. Bake in t preheated oven at 350F for 25 minutes. Remove and let it cool. In the meantime make the sugar glaze. 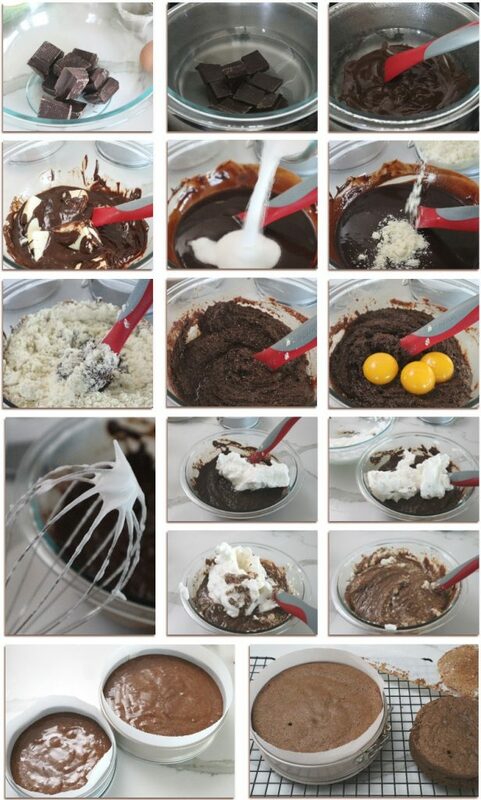 Mix all the ingredients listed under the glaze into a small bowl. 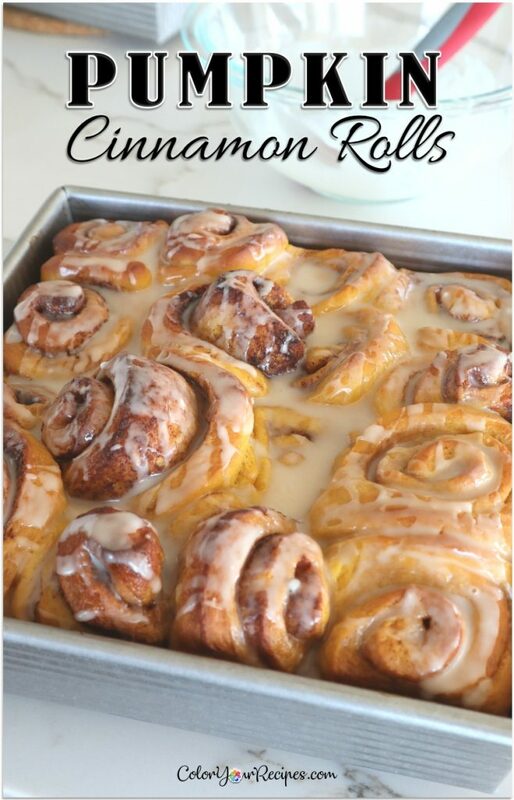 Drizzle over the cool cinnamon rolls. 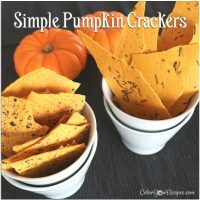 Did you know that pumpkin is super rich in beta-carotene? Your body will convert beta-carotene into vitamin A. Vitamin A is important for your vision, immune system, teeth, and skin. 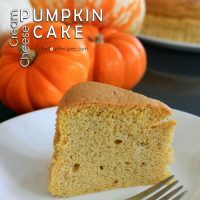 Moreover, pumpkin contains vitamin C, and dietary fiber which is important for a healthy heart. 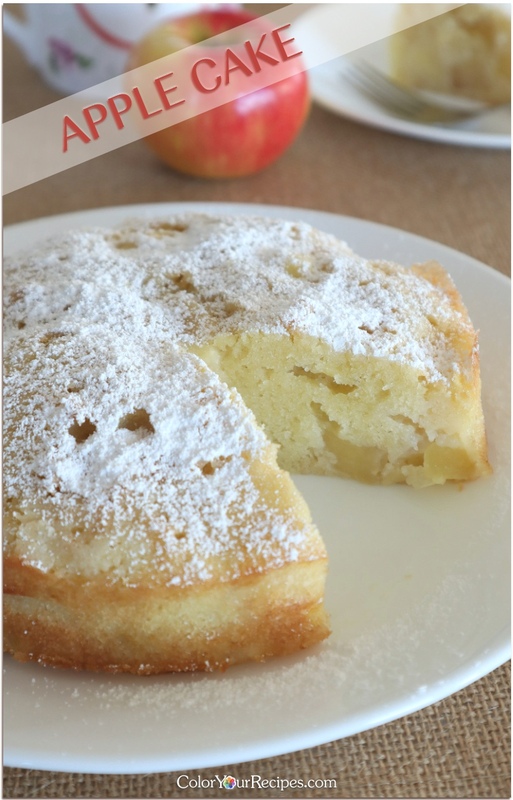 This apple cake is delicious, loaded with apples with a hint of rum…perfect for the afternoon tea or coffee. 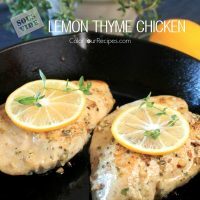 – Where did I see this recipe? 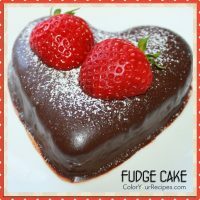 I have wanted to make this cake since I saw it at Zaza’s blog…and today I am sharing it with you. 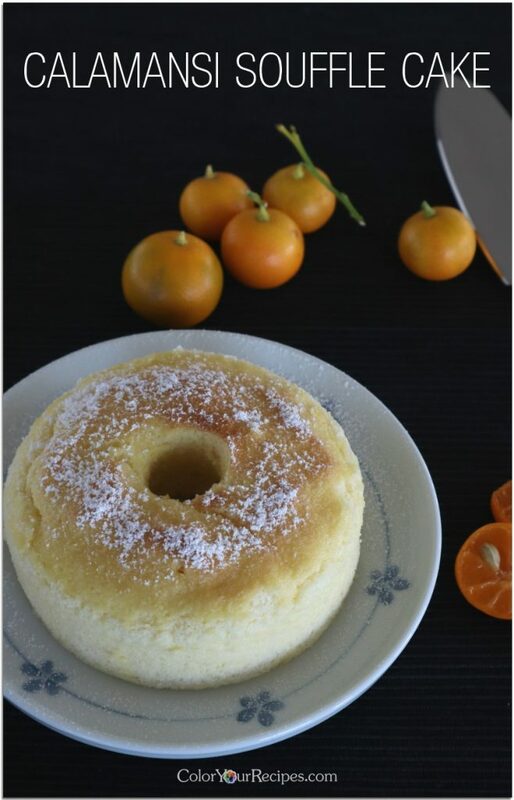 The cake is pretty simple to put together, the only laborious step is the peeling and cutting the apples, other than that it is a piece of cake. – How does the cake taste? 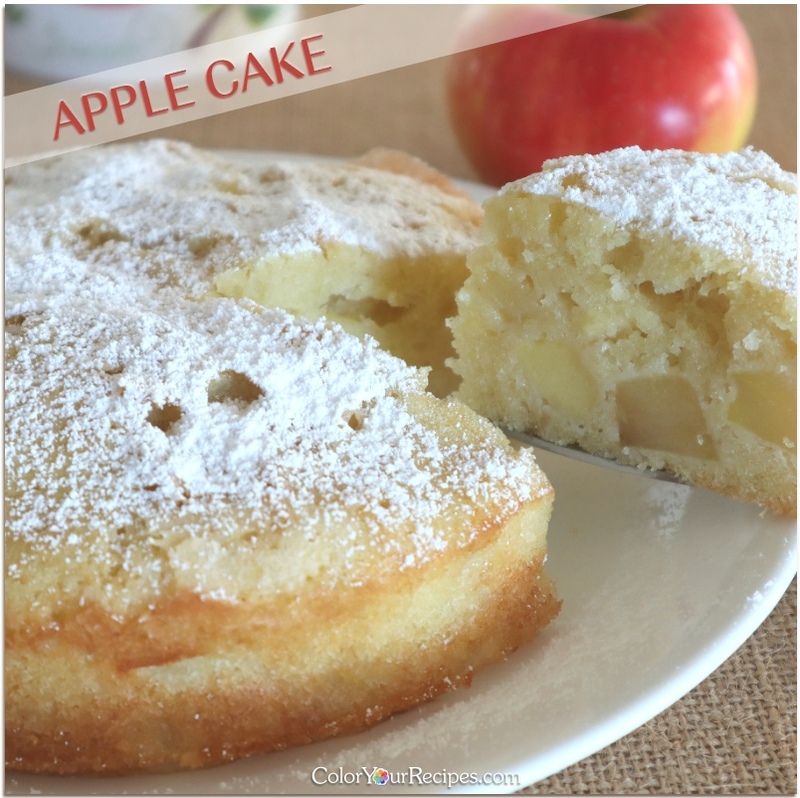 The cake has a quite dense crumb with a lovely hint of rum, the tartness of the apples combined with the sweetness of the cake is delicious especially accompanied by a cup of tea or coffee. I pretty much follow the recipe from Zaza only cut down a little of the sugar in the cake batter. Oh, instead of one 8-inch round pan I poured the batter into 2 small pans (6-inch and 4.5-inch), to give my neighbor. 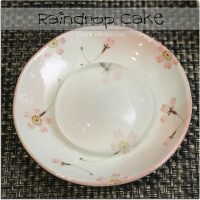 Line the bottom and the side of the springform pan with parchment paper. Using a handled mixer with beaters cream the butter and sugar until light and fluffy, about 3 minutes. Add the eggs, one at a time, beating well and scraping down the sides of the bowl after each addition. Beat in the vanilla and rum. The batter will look grainy, add the flour mixture and mix gently until just combined. Add the apples and fold into the batter with a rubber spatula. Pour the batter into the prepared pans and even the top. 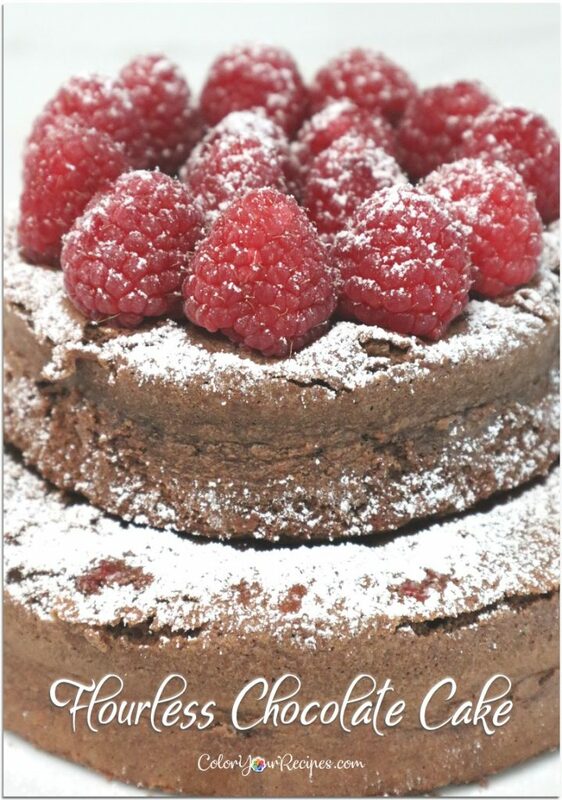 Bake for about 30 minutes, or until the cake is golden and a toothpick inserted into the center comes out clean. 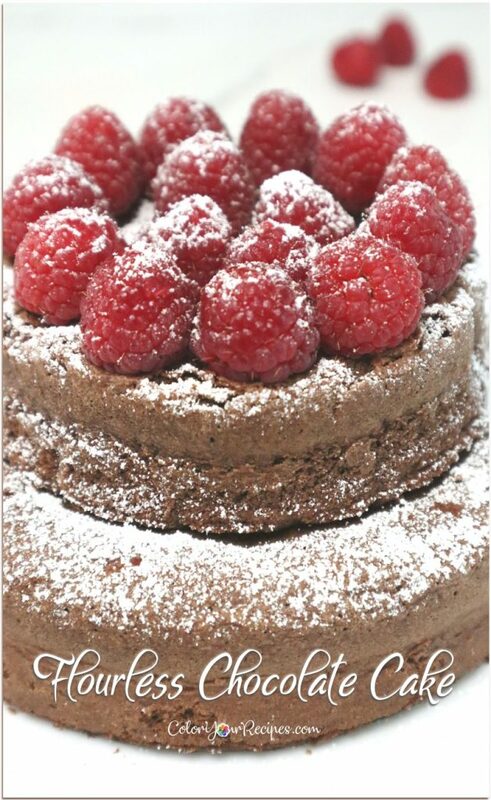 Remove the cake from the form, peel of the parchment paper and let the cakes cool on a rack. 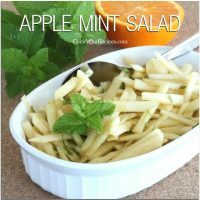 – More recipes with apples? If you enjoy this recipe with apple you might want to take a look at Simple Apple Crisp with Vanilla Ice Cream recipe. Did you know that apples promote healthy in many ways? Apples contain high fiber content and it is a good source of vitamin C, polyphenols which can help fighting weight, cholesterol and heart disease. 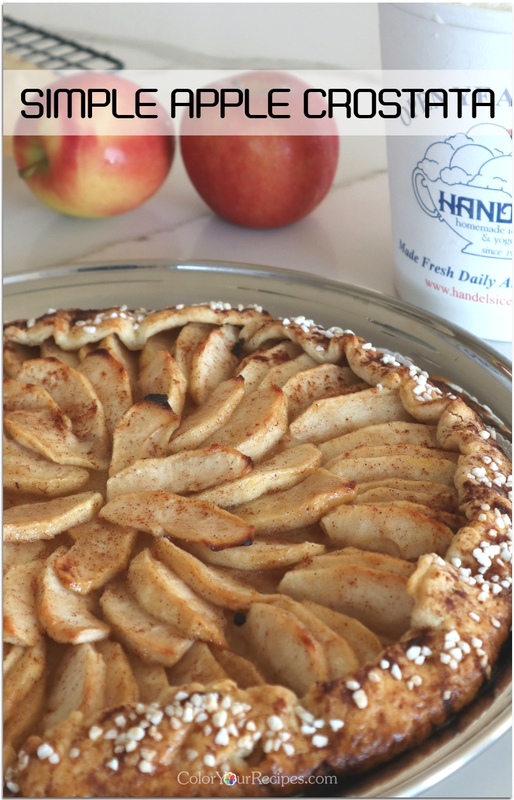 This is a super easy version of apple pie, each slice of this crostata is packed with everything you find in an apple pie…the apple is moist and the crust is light and flaky…and even better served with a scoop of vanilla ice cream. 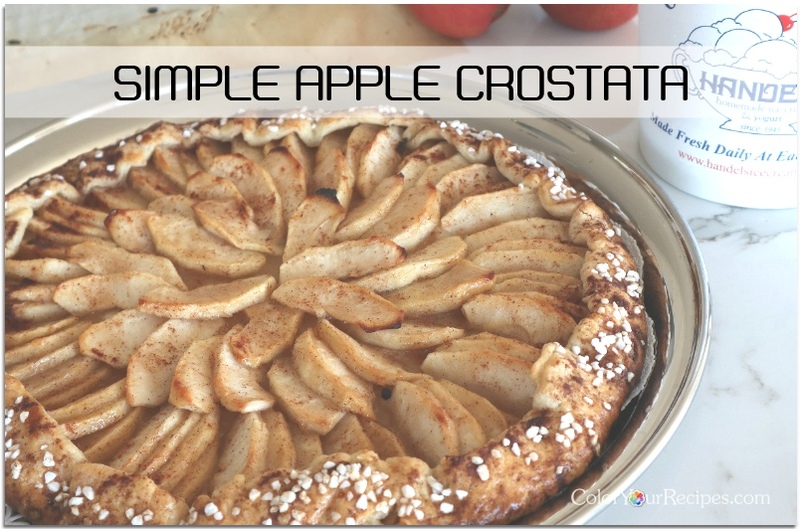 A few weeks ago, I was asked to make a dessert with apple for a dinner, after thinking and surfing the internet for ideas I finally decided to go with an apple crostata, first because of the way it looked and second for its simplicity. 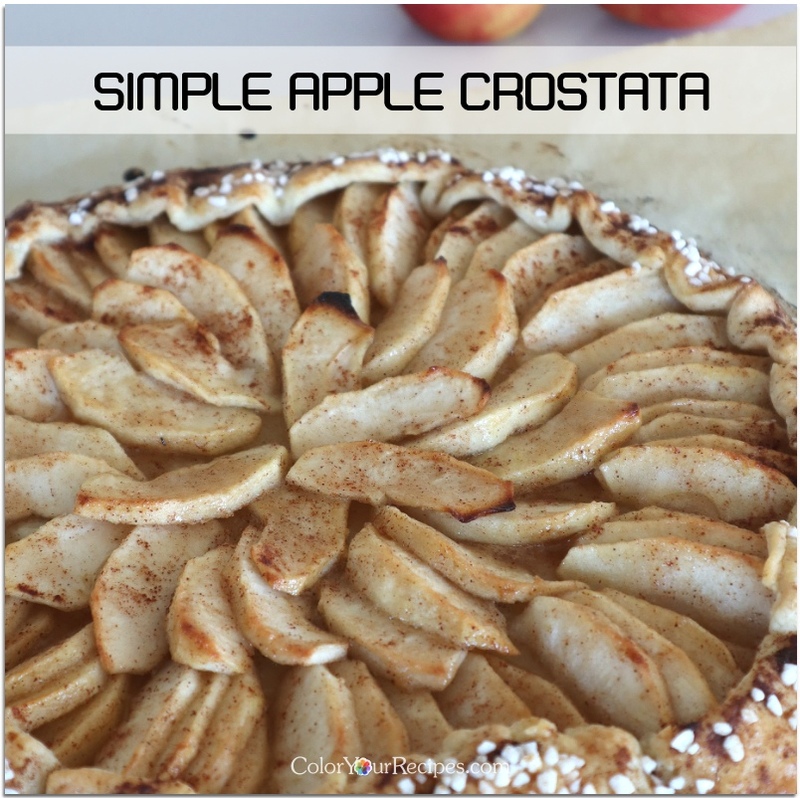 So, if you like apple pie, you will love the apple crostata, which is nothing more than an apple tart. For this apple crostata, I simply used all the ingredients as for to bake an apple pie…and yes, I cheated…I did not make the crust, came directly from Trader Joe’s freezer, but if you like making everything from scratch you have my respect…either way, I can guarantee that you will enjoy this recipe, especially with a scoop of vanilla ice cream. Talking about ice cream, have you ever heard of Handel’s Homemade Ice Cream? Well, if not you should see if there is any near you…the ice cream is to die for, made daily with the most fresh ingredients, once you try their ice cream you will not be able to settle for any other….anyway, so this is what we took to the dinner party. 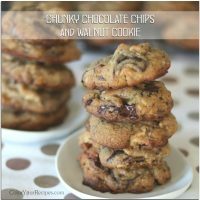 This recipe was a compilation of many recipes from the internet, particularly from here. Make sure the crust is defrosted, according to the instruction of the package. 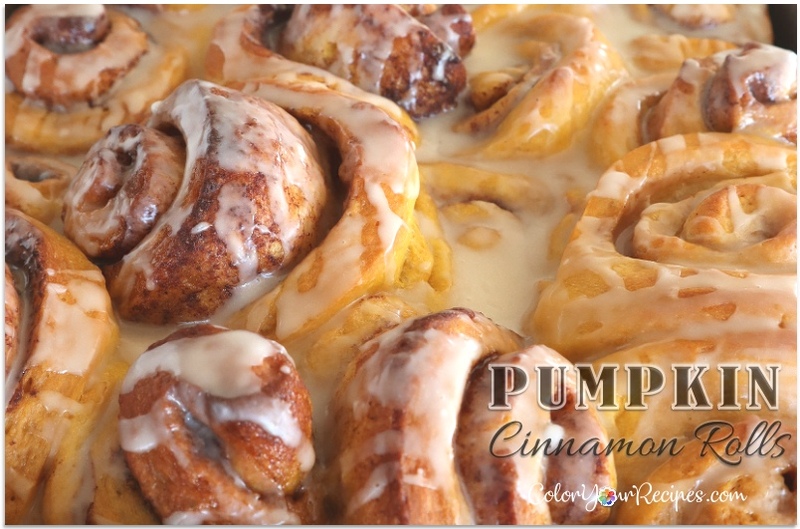 In a small bowl mix the sugar, cinnamon, cornstarch and set aside. Peel, core and slice the apples. Place in a medium bowl. Add the lemon juice and toss it gently, making sure that every apple slice is coated with the lemon juice. Add the cinnamon and sugar mixture and then the melted butter. Again, making sure that the apple slices are coated. 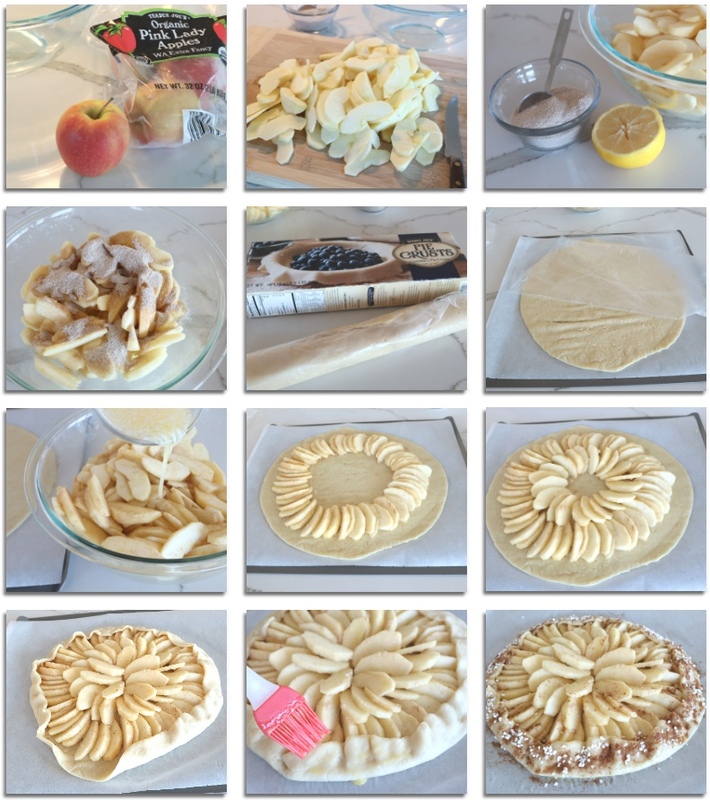 Peel the pie crust and place on a parchment paper. 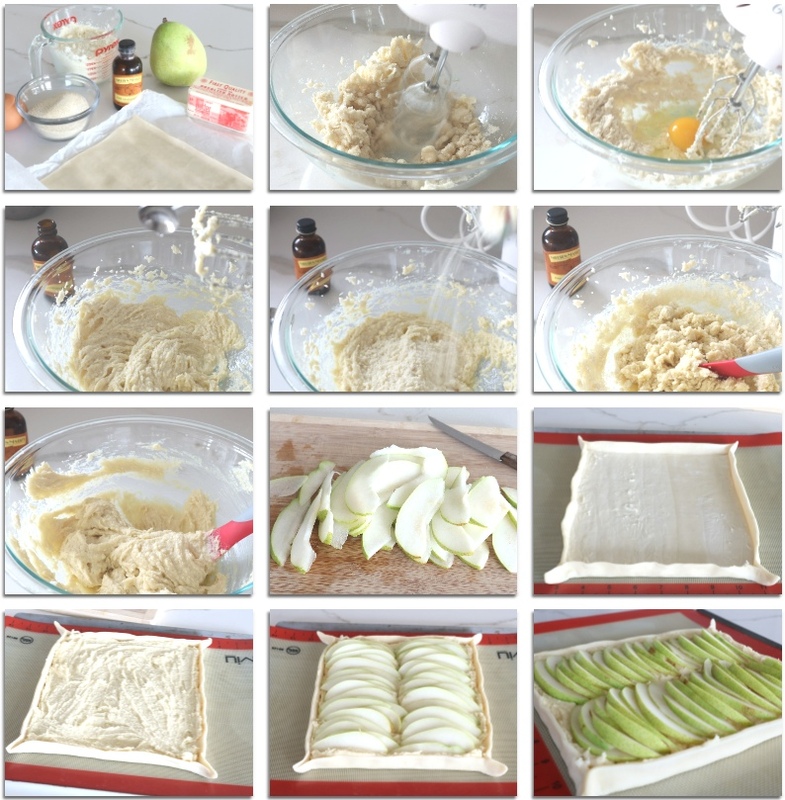 Layer the apple slice orderly in one direction, leaving about 1 to 1.2 inch from the edge. Once the crust is filled with the apple, fold the edge over the apple. 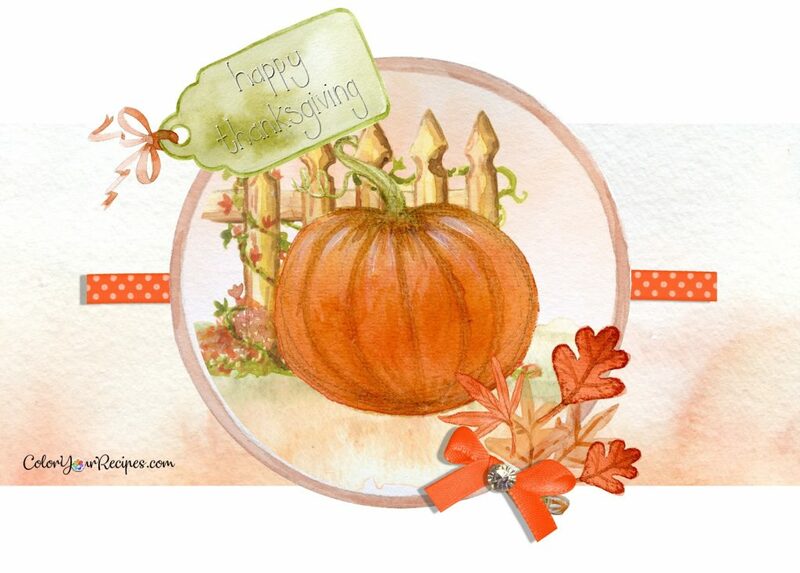 Brush the border with the egg wash and sprinkle with cinnamon and Swedish pearl sugar. Bake for approximately 35 – 40 minutes or until the golden on the top. Remove the crostata from the oven and let it cool before serving. 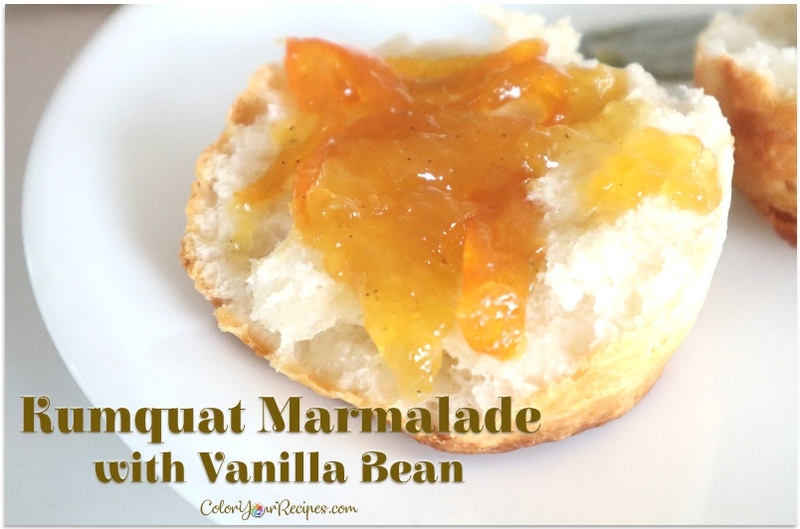 Note: I made another version which a thin layer of low sugar apricot jam (2 tablespoons) was added to the crust before adding the slices of apple, and proceeded as described above…absolutely delicious! 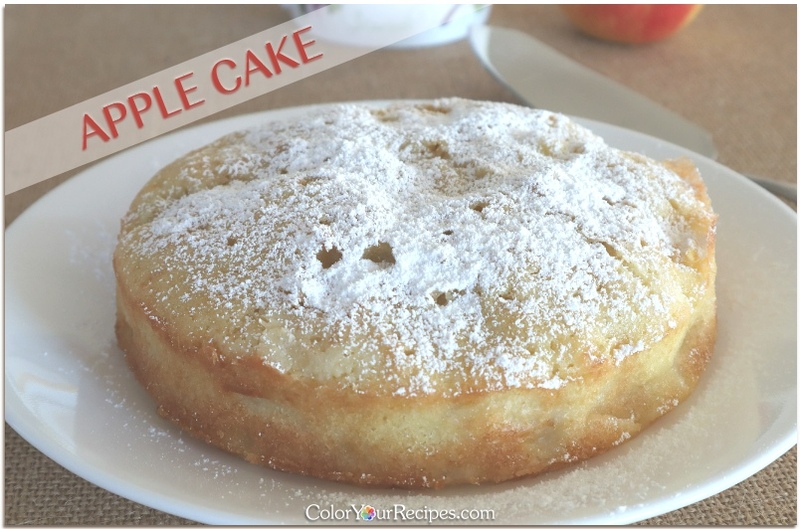 I hope you enjoy this simple version of apple pie. 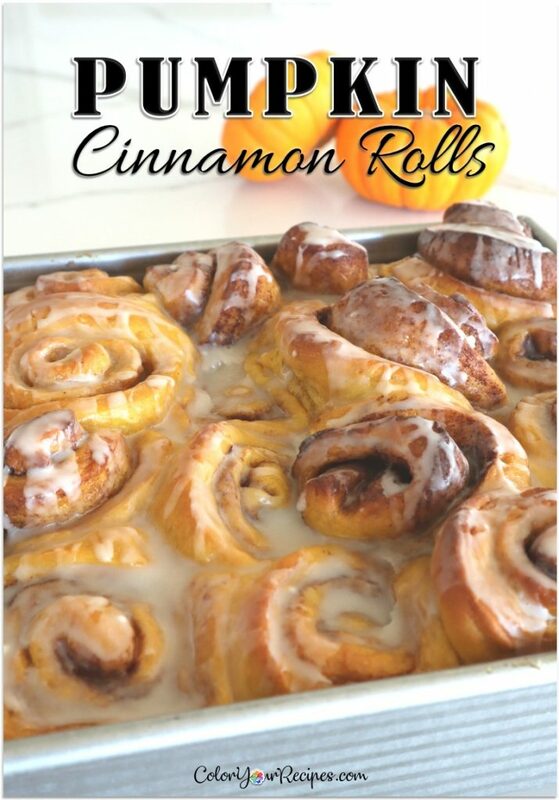 You might want to take a look at Simple Apple Crisp or Apple Filled Buns recipes. Did you know that apples contain pectin? Pectin is used in the making of jam as a thickening agent. 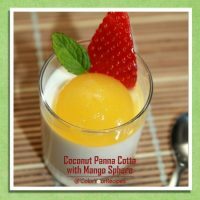 Moreover, pectin is a dietary soluble fiber which can help lower cholesterol. 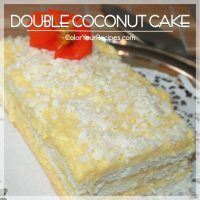 This Asian inspired cake is super light and melt in your mouth, it is easy to make and require just a few ingredients. 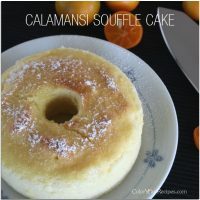 The citrus flavor from calamansi gives this cake a very unique touch. 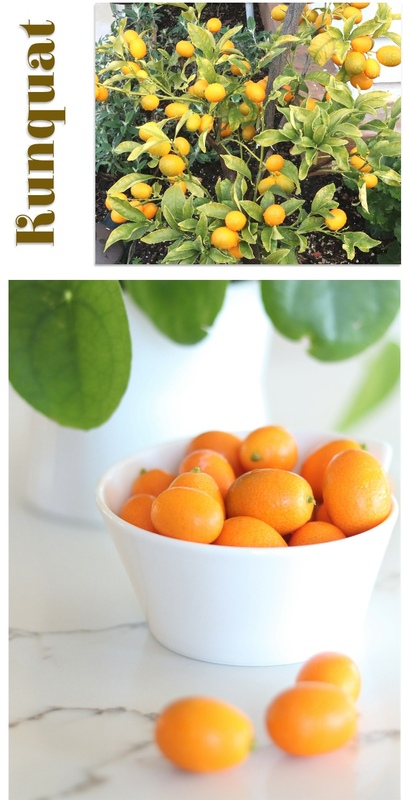 I got this dwarf calamansi tree a while ago and since then it has been given us loads and loads of little citrus fruits which according to Wikipedia it is a hybrid between mandarin orange and kumquat. . In spite of the seeds in it I love how easy is to squeeze the fragrant juice out of it. Often I add to water or use as a lemon in salad and cooking, in another words, anywhere you use lemon I sometimes substitute for calamansi. 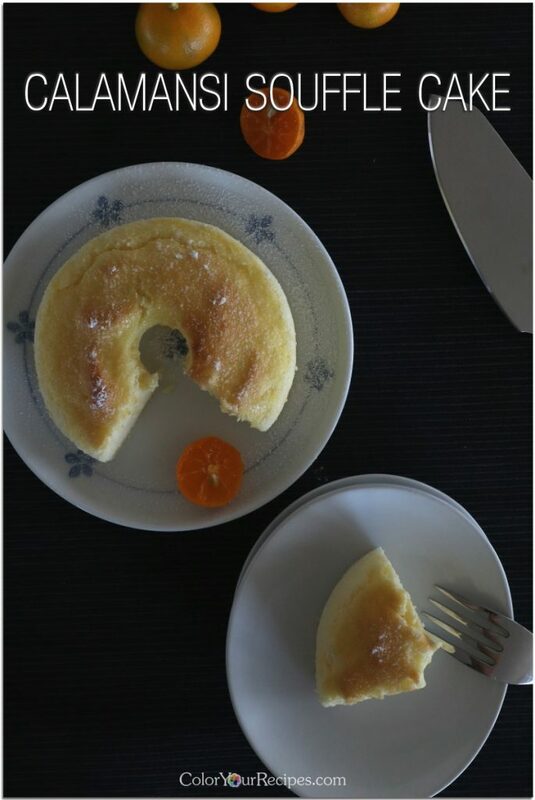 Now you can see how the idea of making calamansi cake was born…the recipe is based on Orange Lemon Sponge Cake from Jeannetay’s Blog, which by the way has amazing recipes for cake and bread. Oh! 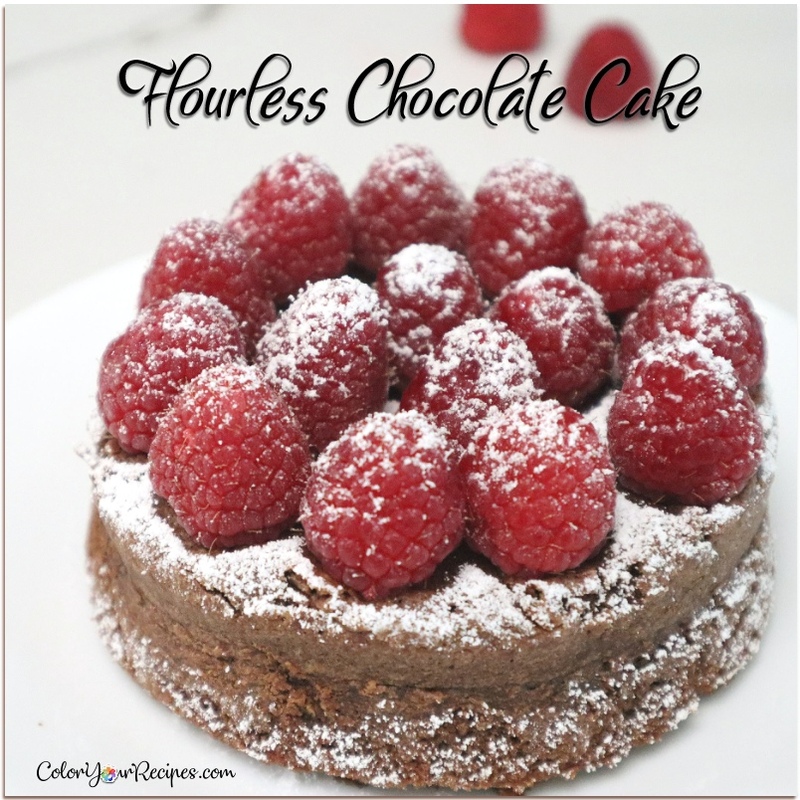 Before I forget, the batter is baked in a water bath (bain-marie), therefore the light and moist texture of the cake resembling cotton…so plan and make sure you have all the necessary tools ready. 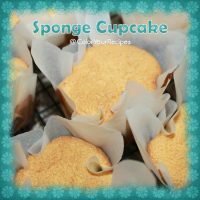 Since I love everything mini I used 2 mini angel food cake pans and one 4” round pan. 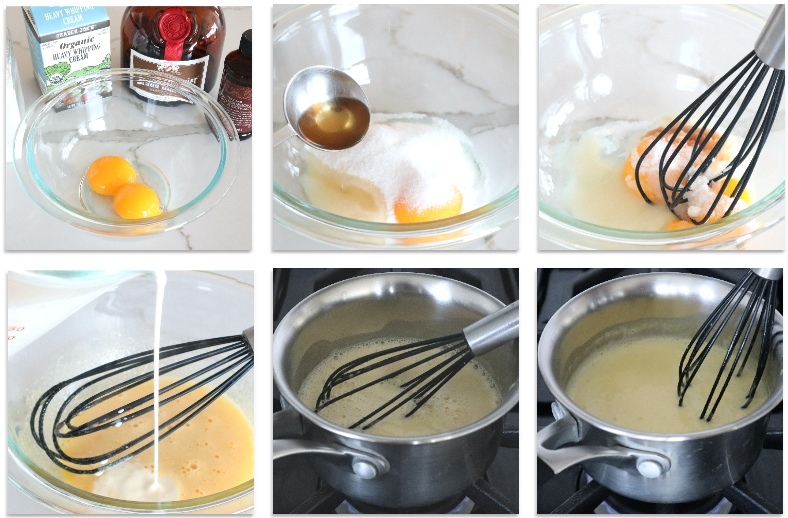 In a large bowl whisk the egg yolk together with the sugar (10g), oil until creamy and the yolk turns light yellow. 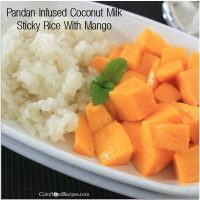 Add the calamansi juice and whisk well. 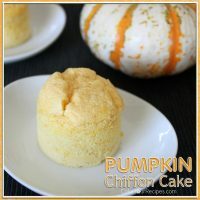 Add the sifted mixture of flour and combine well without over mixing. Set aside. Whisk egg white in a medium bowl until foamy then add cream of tartar, slowly add the remaining 30g of sugar. Whisk until firm peaks form. Add approximately ⅓ of the egg white meringue to the bowl containing the egg yolk mixture with flour and mix gently until the egg white are totally blend in. Add another ⅓, and fold into the batter. Finally add the last ⅓ portion of the egg white to the cake batter folding gently to not deflate the air in the meringue. 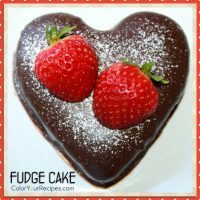 Pour the batter into a prepared 6”pan (round or square, lined with a parchment paper on the bottom) or a 2 mini angel pan (4.5”) plus a round 4” pan. Bake for 20 minutes at 350F. 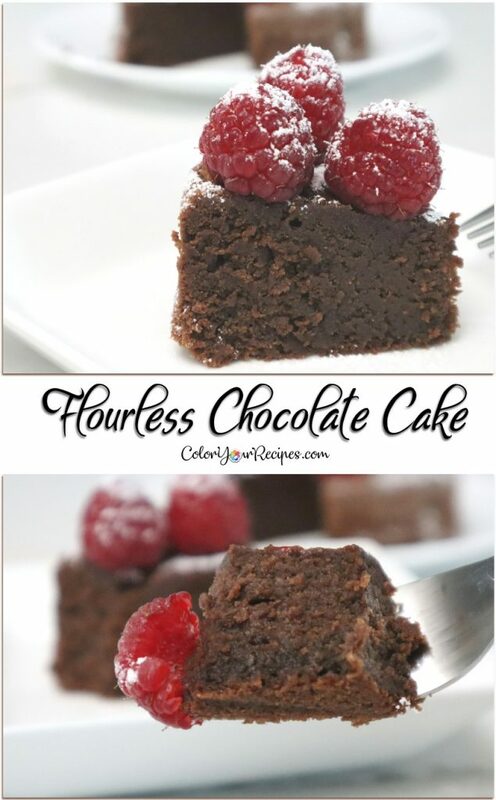 Remove from the oven and unmold the cake by flipping on a plate or wire rack and let it cool. 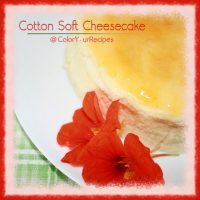 If you enjoy this Asian inspired cake recipe, please take a look at Cotton Soft Cheesecake or Pumpkin Cream Cheese Cake recipes. Did you know that calamansi is packed with vitamin C? 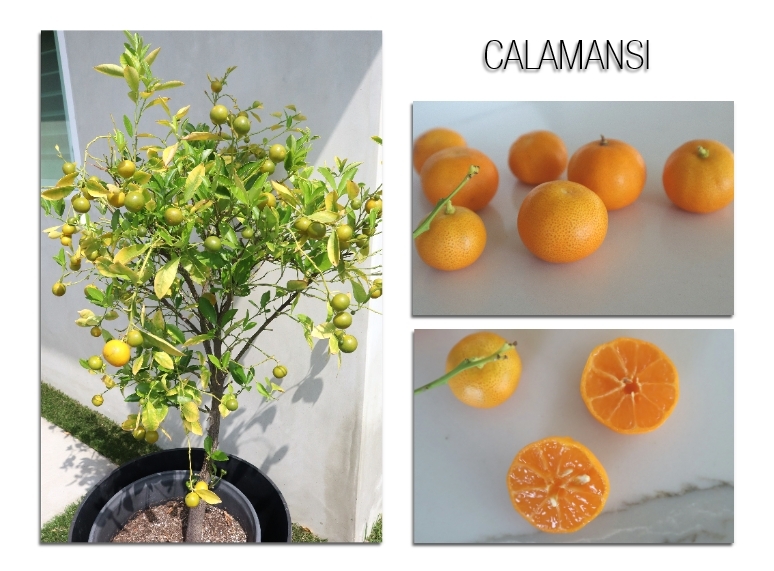 Like all the other citrus fruit, calamansi contains high levels of vitamin C and antioxidants. It is very popular in Phlippines combined with soy sauce and used as marinade or dipping sauce.